Finally we have got the BB Boys!!! if it wasn’t for Millylyly, who knows when these two would be created. I am glad she asked me to design boy’s hair. For starters made these two versions. Curly and strait, which are the two most common. Made in different colors, playing a little bit with length (if one likes) will give quite several hair styles for your dolls. Boys are called BB Boys, because the head and the body (together with legs) are done the same way as BB Dolls. Differences made were at arms length; where these two have total count of 10 rows (by 6 stitches in each row), and instead of dress these two are wearing trousers; and off course HAIR! For the time being don’t have the pattern for the trousers I trust would make good results each time made. Darker blue trousers were done with 1,75 mm needle and finer yarn and those look good and fit good. The the second ones (lighter blue) I made with same weight yarn I used for dolls, changed the row/stitch count to fit the body, but am not satisfied with result. This week will work on the trousers pattern and will have it for you next. Have to be honest that was afraid how to get this “boy’s” face expression using 4 mm black, wooden beads as I used for BB dolls, and after all using same pattern that was created for girl dolls in mind. As you can see, boy’s eyes I placed closer. Instead of leaving 8 stitches space between them, they have only 4. Added embroidered nose, but this is optional. One more photo of boys playing before we continue on hair pattern. For both of the hair bases, classic oval shape of 30 stitches count needs to be done. I have made mine this way. For both hairs is the same! Oval shape, 30 stitches count row before making the stylish hair cut! You will be making hairs out of each stitch of all 30 stitches row count. Finish off! Leave long end for sewing the hair to the head. You have made 30 hairs! continue making curls in every second stitch of the base row. ch16, starting at second stitch fro the hook inc15. Here is the hair “length” count you have to do in order to get the right shape. Finish off leaving long end for sewing the hair to head. Once done, sew the base of the hair to the head. Arrange the hairs the way you would like them to be/stay and sew or glue them. I didn’t sew the hairs! I used hot glue to fix them on the head. I am here to help you out, so do not hesitate to ask! Wishing you all great end of the week and wonderful weekend to come! 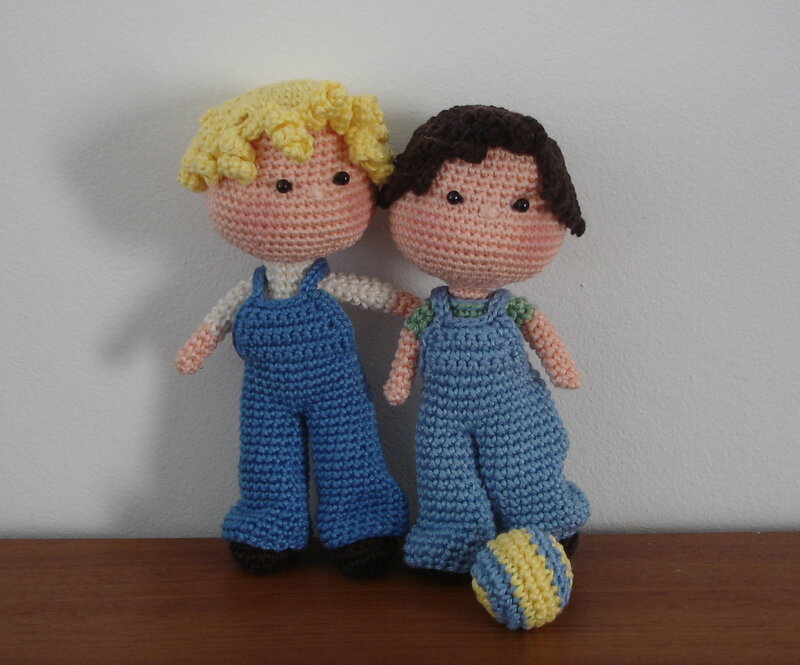 Hi, I just love your patterns and have made a few of your dolls. 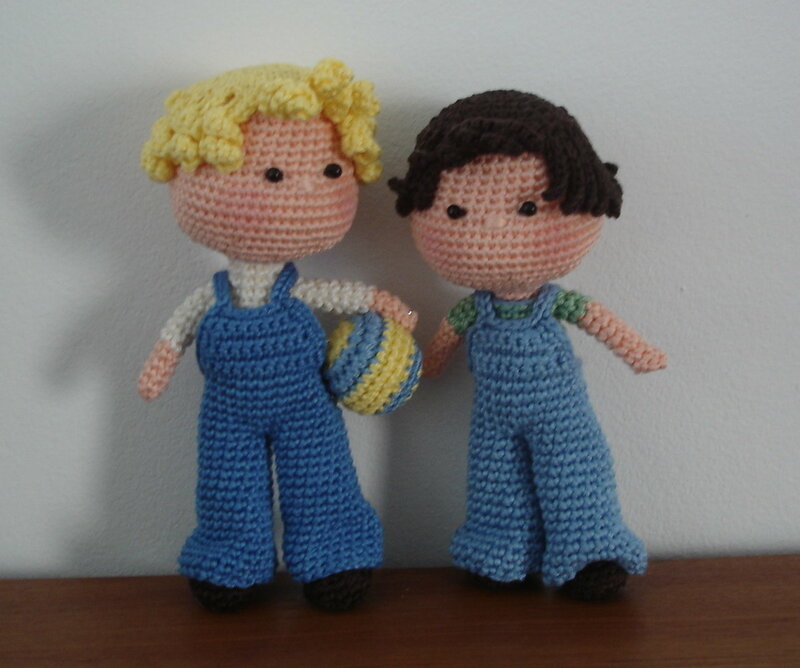 Do you know when you’ll have the pattern for the overalls, as I would love to make a BB boy!